Bespoke music for all occasions - We work with clients to give them exactly the music they need, from current chart hits to tracks from any decade and in any style. 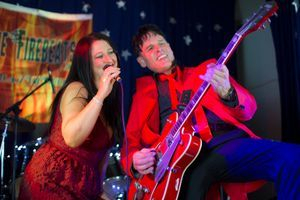 We're up for a challenge too, so whether you want a brand new release, obscure favourite album track, first dance track or to put on a themed event, such as James Bond, Halloween, Americana, Murder Mystery or a particular decade, The Firebeats do it all. Slick, professional and dynamic performances guaranteed to make your event.! The list on the left is updated at pretty much every event as we love to get requests to play new material. With about 300 tracks and rising in our repertoire, and the ability to add pretty much any track in any style given a bit of notice, we believe that you will be amazed by the range we provide. The set list below was recently played at a wedding where we were asked to do a mix from the 50's to today with a real mix of styles for guests of all ages. What a blast! We often start mellow and build to a big finish with a dancefloor full of happy people. We always work with the hirer and often add in requests and dedications at the event. This is obviously just a taster. The list on the left is being added to all the time and the band can add in tracks as they go along. First dances, tracks that bring back memories, favourites from your group past, the song that was played over and over on holiday, group anthems, or something to honour guests. Anything goes... Contact us HERE>>> to arrange the music for your perfect night! And if you want us to play something that isn't in the list, that's not a problem. We love to learn new tracks and, with a little notice, can drop in pretty much any song (no-one's beaten us yet with a special request - even Bohemian Rhapsody, though we like plenty of audience participation on that one!). We have included some videos below, but to do real justice, drop us a line HERE>>> or come along to a gig. We make some public appearances at our favourite venues, especially in our alter ego's (as above) and can often be found at wedding fairs across the North East and Yorkshire.